The crafty mom’s right of passage. 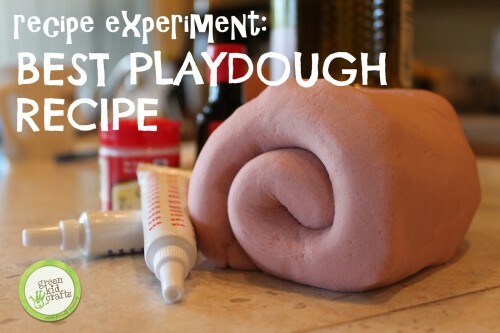 But which is the best playdough recipe? Cooked? No-cook? Microwave? 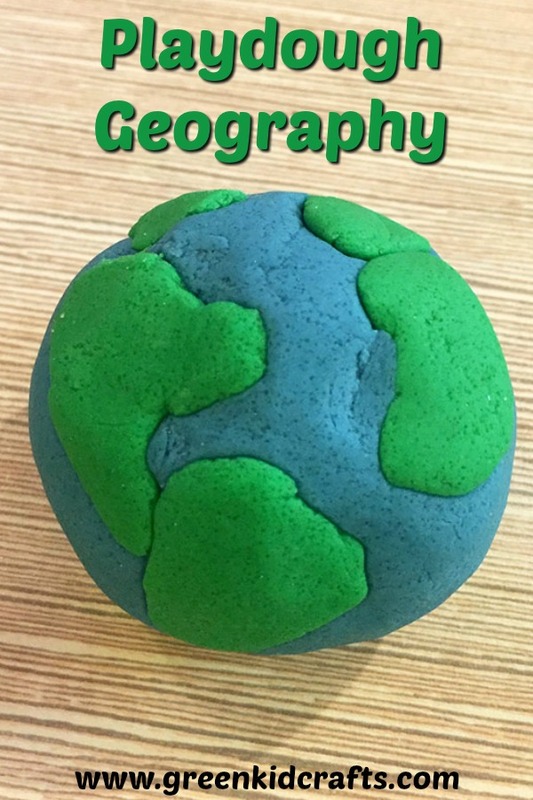 Keyword search “playdough recipe” on Pintrest and be prepared for a tidal wave of pins. If you take the time to start looking through them all, though, there really are only a few variations. 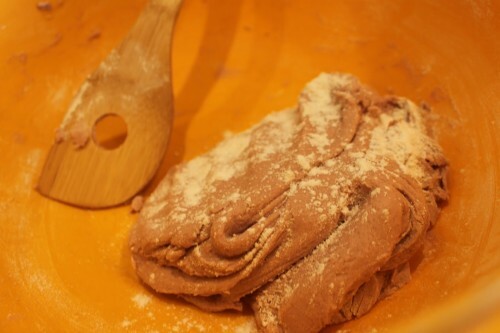 For traditional playdough, the ingredients are the same. 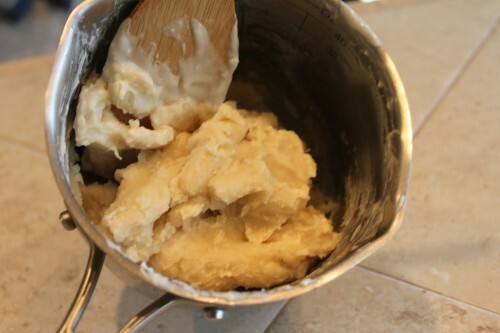 Flour, salt, water, cream of tartar, and oil. We tested four of the most popular variations and found one that is hands down the best! Of course it isn’t the “no-cook” recipe. Of course it wouldn’t be the 2 ingredient 5 minute recipe. Not to worry, even with the added step of cooking, We were able to make it easily in 15 minutes (during nap time, of course). #1) 2 ingredients. No cooking. 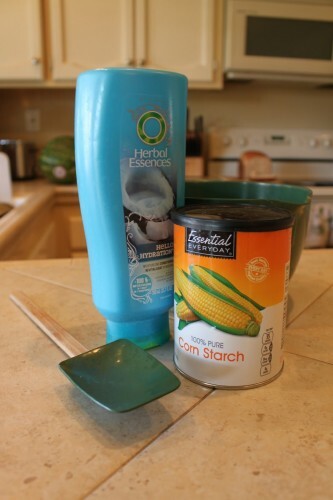 2 1/2 cups corn starch. Mix e’m. It’s that easy. I used a spoon at first, but then found it easier to just get my hands in there and knead it. 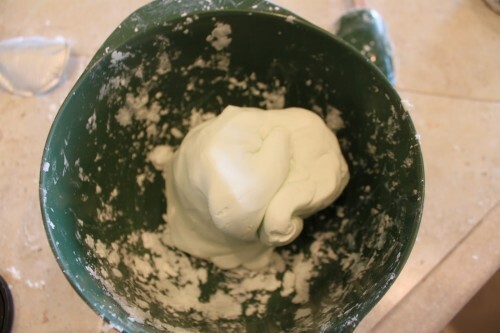 While the result is very silky and smooth, it’s not play dough. 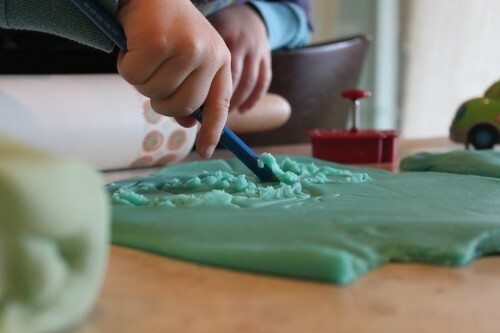 It’s fun and can roll and be cut like play dough, but it isn’t very elastic and it crumbles. Corn starch is insidious. I’d put it right up there with glitter when it comes to mess potential. I’ve only ever used it in table spoon amounts for food but handling cups of the stuff at a time opens the door for powdery explosions of dramatic and hilarious proportions (if you find that kind of thing funny.) It mushroom clouds up with the slightest jostle or hurried measuring cup dump. I don’t know how to say this with a straight face, but conditioner burns when you get it in your eyes. Yea, I didn’t really think that one through. I just recently chopped all my hair off and now have a surplus of the lovely coconut scented conditioner I use and thought- perfect! It’s a pretty blue color and smells great! If you use this recipe, it’s really not bad, just consider using something tear-less. While I was kneading the dough, I rubbed my eyes and ended up having to wash my face to get rid of the sting. I can imagine little kiddos having a tough time with that. This also means it isn’t edible. Of course, we aren’t looking for a snack recipe here, but it’s in their hands, it’s gonna get eaten. This went fairly easily. I had my little wingman with me this time and he was very excited to dump the dry ingredients into the bowl. 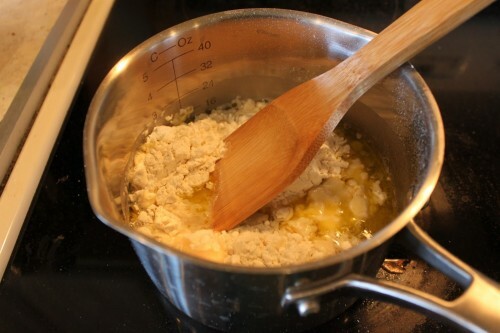 I combined the dry ingredients, whisked them together, and added the oil while my water boiled. Not sure how this means it’s a “no cook” recipe, though. I got a pot hot on the stove. So…I cooked! I added the food coloring to the water and then poured it over the dry ingredients and stirred till it all was combined. But it was too wet! It’s completely possible that I mismeasured somewhere along the way with all the “help” I was receiving from my sweet angel baby. I ended up adding 1/4cup more flour by sprinkling it lightly over the dough and kneading it in. I kneaded and kneaded and it just never really felt right. I finally got it to stiffen up enough but decided I needed a re-do unassisted. I made this just the way I made the other with the exceptions of substituting the olive oil with coconut oil and I added 1/4 tsp of coconut extract. It worked much better and had a much firmer consistency. 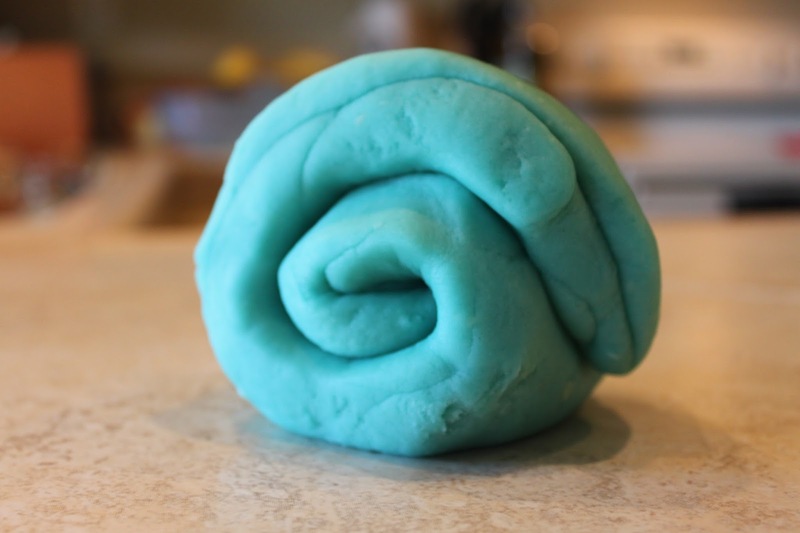 This play dough is nice and firm, not sticky or crumbly. Perfectly serviceable. Next add it to a pot with the wet ingredients and stir continuously over medium heat and I do mean continuously. I left it a few times to “multi-task” and came back to lumps sticking to my pot. I was able to scrape them off but low, slow, and constant seems like it would be best. It takes just a few minutes for the liquid to disappear. 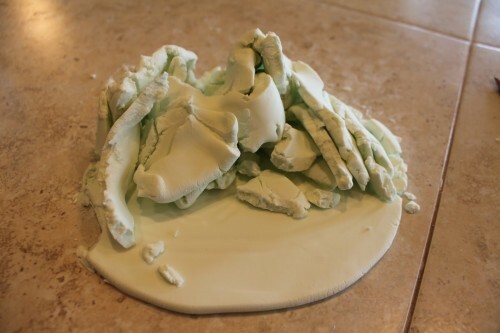 Then I dumped it out onto my counter, dripped some food coloring on it and began to knead it. From what I’ve read, giving it a good thorough knead helps give it the best consistency possible. To me, that meant I just folded it and smushed it over and over till the food coloring was mixed in and called it good. 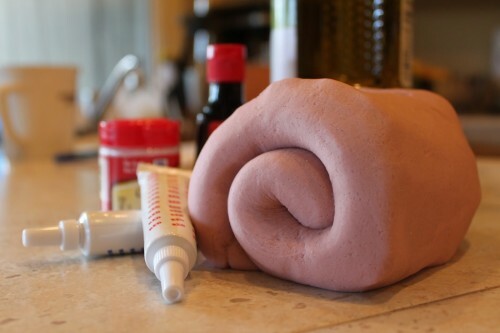 It makes a wonderful dough. Firm and elastic. Not sticky. Doesn’t crumble. It holds any shape and still re-forms nicely. I like it even better than the name brand stuff. This one is a clear winner and, even with the cooking, was so easy an novice with a stove can do it!